Apple wins over Samsung in Germany, additional countries to follow? Apple will likely be breaking a few bottles of champagne this weekend as the German court on Friday ruled to uphold the Galaxy Tab ban that began almost one month ago. As reported on Bloomberg, sales of the Samsung Galaxy Tab 10.1 will continue to be prohibited on German soil, although other EU countries can still sell the tablet. “The court is of the opinion that Apple’s minimalistic design isn’t the only technical solution to make a tablet computer, other designs are possible,” said Judge Johanna Brueckner-Hofmann. In other words, the existence of so many other competing tablets, each with their own respective but differentiating designs and software, proves that Samsung had many design choices and options for the Galaxy Tab 10.1. In the end, the Samsung tablet was to too similar in design to the iPad 2. As for future Galaxy Tab models such as the Galaxy Tab 7.7, Samsung will be unable to market these devices in Germany as well. 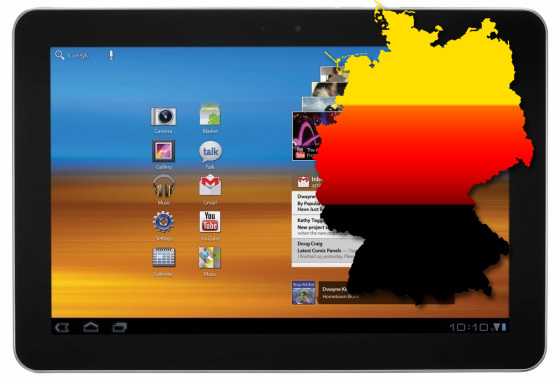 All traces of the tablet were even pulled from the IFA earlier last week. Meanwhile, the release of the Galaxy Tab 10.1 is still up in the air in Australia and Apple has already begun suing Samsung in Japan over similar claims. The Galaxy Tab maker will have to do all it can to defend itself or it could risk losing more sales opportunities in key regions around the world.